Remodeling you kitchen will add great resale value to your house as well as providing you a renewed sense of enjoyment for one of the most active and popular rooms in most homes. There’s no reason though that it has to cost you a fortune to get some great improvement. 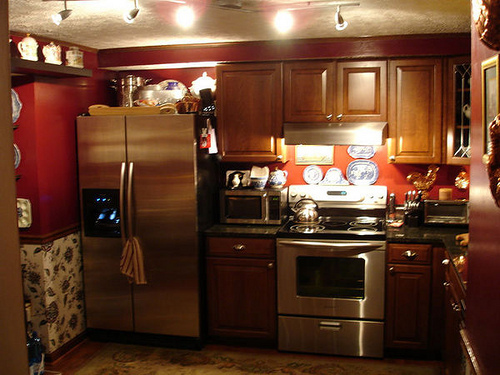 Kitchen remodeling on a budget is possible. Here are some kitchen ideas on a budget that could do the trick for you if you’re thinking some small kitchen remodel ideas just might be on the menu. Often, something as small as re-accessorizing will make a huge difference in the feel of the room. Changing the knobs and pulls on your kitchen cabinetry is an easy, cost-effective way to give new life to the kitchen; you might go for some snappy attention-grabbing color and styling or a more subtle introduction of a coordinating finish. In a previous post, I provide you a top 10 bestseller list of knobs and pulls. Over the last 30 years, the widespread use of composites and particle board and veneers has made refinishing of cabinetry impossible. However, going over the grain with a few coats of paint can create a sharp new appearance that harkens back to the classic kitchen. An oil-based finish is far more durable, better standing up to everyday kitchen grime than latex. Add to that a coordinating primer. Remove the cabinet doors and drawers and number them for locations so they’ll be easy to reattach. If you provide a good cleaning, sanding and careful application of the primer and paint, you’ll be happy to find yourself with a kitchen that looks brand new! Today there is such a wide range of styles and constructions available for kitchen faucets. For something around $100, you can improve upon the style standard and improve your kitchen sink utility. You can reduce your water use to a convenient and conserving flow rate of 2.5 gallons per minute by adding an aerator to current faucet models. How about adding organizers to your cupboard and drawer space? These can be pretty inexpensive while allowing you to make much better use of your kitchen space. Also, spice racks and specially sized lazy Susans can provide great organizational benefits. If you’re thinking this is too out-of-the-way and won’t benefit the aesthetics of your kitchen, think again. There will be discernible improvement in the tidiness of both cupboards and counter space. Things age slowly, but it all adds up. Accumulated kitchen art, worn out hand towels and rugs which you hadn’t noticed had gotten so raggedy can ever so slowly grow to give a kitchen a dated look. Every once in a while a clean sweep is called for in the decor of the kitchen. Spring for some new throw rugs in some of the many easy-care colors and fibers available, do a little discerning curating of displays of collectibles, and why not throw in a new decorative feature, perhaps a designer bulletin board for display of the kids’ art projects. So, you see, kitchen remodeling on a budget is possible. I hope these 5 quick tips for kitchen ideas on a budget provide some small kitchen remodel ideas that suit your needs and put some of the zest back in your kitchen.